Here are some best free websites to convert CSV to YAML online for free. These websites take a CSV file and return the data in YAML format. All the websites that I have added here are simple and can be used without any registration. On most of them, you just upload the CSV file and specify a custom delimited to generate the corresponding YAML file. The bulk conversion functionality is missing but if you have some CSV files then you will be able to convert them to YAML in just a few seconds. YAML files are generally used in programming work to save data related to environment and some other information. YAML has a specific file structure and you if you want to create that by using data from a CSV file, use any website from this list. Just give anyone of them a CSV file and they will generate corresponding YAML file for you. After getting the YAML file, you can do whatever you like. And not only YAML, but these sites can help you convert CSV to Excel, JSON, etc. CSV to YAML Converter(homepage) is free and straightforward website to convert a CSV file to YAML. You can upload a CSV file here or simply paste the CSV data and get the corresponding YAML data. Before actually converting the data, it even lets you specify a custom delimiter as well. To convert a CSV file to YAML, you don’t need to create an account here. Just reach the main websites using the above link and then upload the file or paste the contents of the CSV file. Lastly, hit the “Convert CSV to YAML” button to start the conversion. It will show you the YAML data which you can save as a file or just copy it to use it wherever you want. Another thing which is worth mentioning here is that, you can upload a CSV file here from a remote location as well. For advanced option, you can change the encoding of CSV. 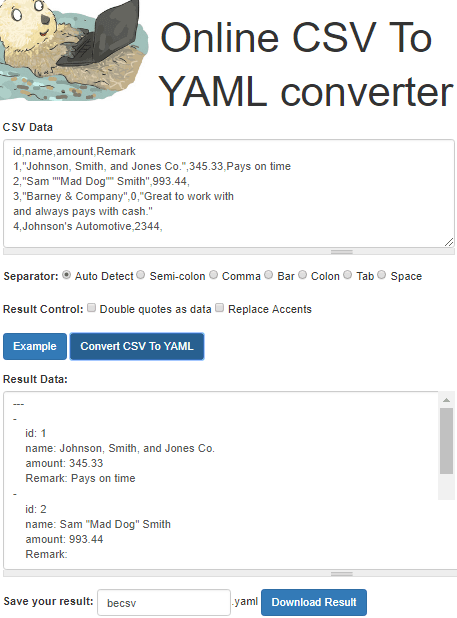 Online Yaml Tools is another simple website to convert CSV to YAML free. Here this website is a collection of tools meant for YAML data manipulation that you will like. Here you can convert some other type of files to YAML as well if you want to. 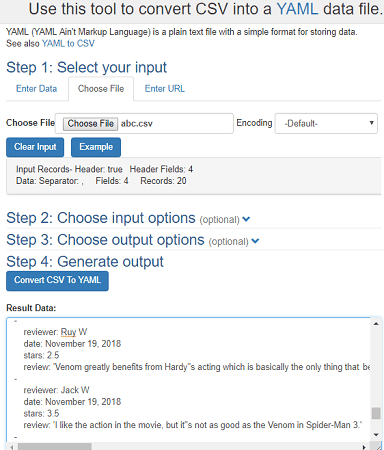 To convert data from CSV to YAML, you can either upload a file from your PC or manually paste CSV data on its interface and get YAML in output. You can either copy the final YAML data to the clipboard or download that on your PC. Here it supports the multiple type of CSV files and you can specify a custom delimiter if your input CSV file has one. After the conversion, you can opt for the “chain with…” option. Basically, this option lets you use the generated output to be used as an input for other tool on the website. After chaining, you can search for a tool in it to which you want to fed the YAML data. 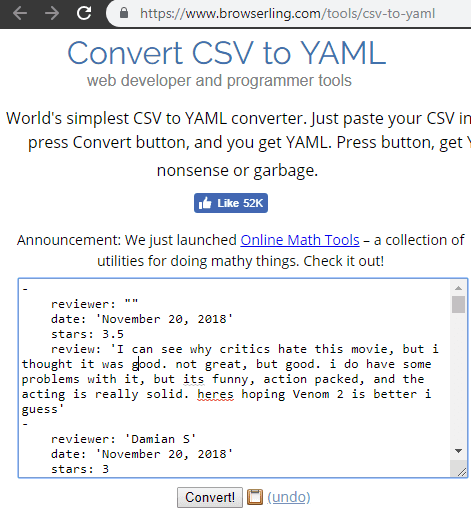 BeCSV is yet another website to convert CSV to YAML that you can use for free. 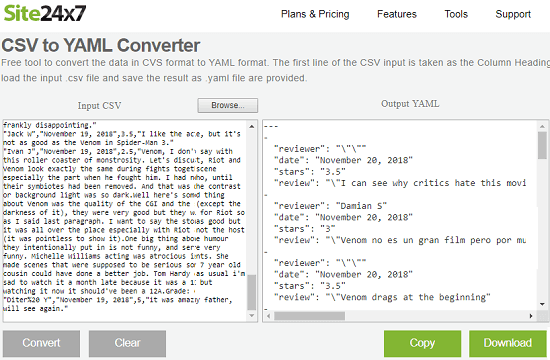 It is a powerful online tool to quickly convert any type of CSV file to YAML. If you want to try it without uploading original data then you can do that as there is an option in it to test the conversion on sample data. It supports different type of CSV delimiters and there are two ways to submit CSV data and get the corresponding data in YAML. And you can do that without any registration or sign up. So, simply use the above link and reach the main page of this tool. Upload the CSV file there or simply paste its contents. After that, you just get the YAML data which you can either copy from its interface or download as a file. Site24x7 provides a free tool for CSV to YAML conversion tool. It is a very simple tool where you just paste the comma separated values and get output in YAMl format. You can copy the YAML data and even download it as a file. The data conversion is perfect, however here this website only supports command delimited files. If your CSV file has a different delimiter than comma then you won’t be able to convert it. Just like other websites in this list, you don’t have to sign up for a free account here. Just submit the data in CSV and get the output. There are some other tools on the websites that you try related to other conversions such as regex parser, thread dump analyzer, JSON path evaluator, and some others. Browser ling is also a huge collection of small tools related to data conversion. And there is a tool there which you can use to easily convert any CSV file to YAML. Here you have to manually paste the CSV data and get the YAML data in a few seconds. After conversion you just copy the YAML data and then save that in a file. This is a bit different tool which you can use to convert CSV to YAML. Use the above link to reach the main page of the website and then paste the CSV data there. Hit the “Convert” button and it will leave then YAML data in the same box. Copy the YAML data from there to the clipboard and then use that wherever you want. These are the best free CSV to YAML converter websites that you can use. You can use any website in this list to quickly convert a CSV file and other formats if you want to. If you have a CSV file which has a delimiter other than command then most of these websites can handle that part. The best part about all these websites is that you don’t have to create an account or register to use them. Just open these websites, upload the CSV file and get the YAML data. Simple as that.